No stage gate or portfolio reporting solution can overcome poor input data. The organization has to be willing to commit to consistent and rigorous updates of the information, or the reporting becomes useless. From what I've seen of competitive systems, Bubble Innovator is the easiest to use in this regard, so the excuse of not having good data because it's painful to upload or cumbersome to retrieve goes away. And the ease with which you can produce customized reports allows you to immediately find the gaps and weak points in your data, and take action to address them. That's not to say that every report and function in Bubble Innovator is perfect. But the close collaboration and responsiveness of the Bubble Innovation team has made it relatively easy to triage, prioritize, and implement improvements along the way. I already mentioned the simple user interface for data upload, and the equally intuitive customized reporting. Leadership and "supporting" functions for product development get tremendous value from this because they don't need to hunt down answers anymore. Everything from pipeline planning to operational planning can be built on the same foundation of objective data, rather than many different sources interpreted through many different lenses. The biggest issue we've had in the past is customized reporting. But this has now been addressed with a new module dedicated to enabling any user to build the report to exactly meet their needs and address the questions being asked by their leaders. There is always room for improvement here, and the leadership demands for alternative views are frequently evolving, but with the customized reporting ability we can deal with this evolution far better than ever before, and beyond the capabilities of any competitive product I've seen. The user interface is highly visual and simple. Literally within 10-15 minutes of my introduction to the software, I was up and running. Of course, deeper capabilities become apparent after additional use, but the basic functionality is very simple to grasp. Where there are consistent challenges reported by multiple users, the Bubble Innovation team is quick to connect and put plans in place to address the challenges. I've mentioned it already in this review, but this is really a strength of Bubble Innovator. The team is highly engaged in helping solve challenges to make their customer's lives easier. The number of variables made this extremely challenging (org changes, stage gate harmonization, pipeline prioritization, and new governance model). I think the implementation was handled very well in spite of this, and managed to deliver on time and on budget. 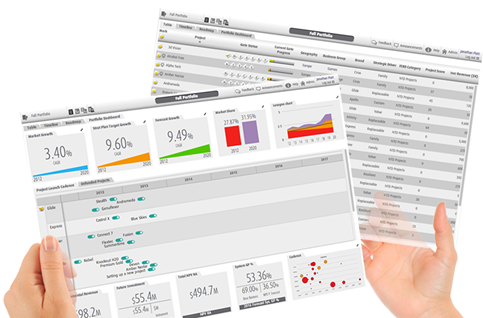 Bubble Innovator provides dynamic dashboards for Project and Portfolio Management.